That little bit of lore became even more interesting recently when I heard that it is a long and continuing tradition for the head of the British Secret Intelligence Service to sign all documents in green ink. The oddness of the idea that green ink bears so much meaning, and the ironic connection between the psychologically challenged and the professionally paranoid bore more investigation. How exactly did the colour green come to have such negative significance to the British? No one seems to be able to say for sure which came first, but it appears that the tradition of the SIS – also known as MI6 – using green ink was established before the colour became associated with nutty behaviour. In 1909, Mansfield Cummings became the first head of MI6 and fell into the habit of signing all of his documents with the letter “C,” always written in green ink. There is some speculation that this was a carryover from his days in the armed services, where senior officers supposedly used green ink. Meanwhile, journalists in the UK frequently refer to the crazy letters they receive from readers as coming from the “green ink brigade.” The Guardian even goes so far as to instruct readers to avoid using green ink if they write letters to the editor. The general consensus seems to be that the term comes from the fact that many of the nuttier letters that journalists receive are written in bright colours, or with words underlined heavily with bright inks. Michael Quinion, who runs the World Wide Words site, tried to dig into the history of the green ink designation. While he didn’t discover any definitive origin for the term as applied to eccentrics, he did turn up several interesting early uses. The first, he said, came from the 1953 satire by Kingsley Amis called “Lucky Jim.” In it, the main character receives a dubious letter “ill-written in green ink.” Then, Carl Sagan also mentioned green ink 20 years later in his book, “The Cosmic Connection. How it all got started it still a mystery. However, it’s not uncommon for paranoids in the US to have all sorts of crazy fantasies involving the CIA or aliens, or maybe both working together. Given that, you have to wonder if the knowledge that the chief of MI6 uses green ink hasn’t fuelled at least a few lunatics’ imaginations, to the point that they, too, began writing in green ink as a way to give themselves more authority. It’s even showing up in British schools, as teachers move away from using red ink to mark incorrect papers. Former headmaster and Telegraph contributor Peter Dix, for one, is not a fan of the practice of using green ink in schools. Still, the colour of crazies or not, green ink can be a lot of fun, as the delightful Diane at Pocket Blonde reminded us just yesterday with her discovery of a new Uniball Signo DX with emerald green ink. And who doesn’t get bored sometimes with plain old blue or black? But you tell me, now, readers – what do you know about the green ink brigade, and does the lore keep you from using green in your correspondence? 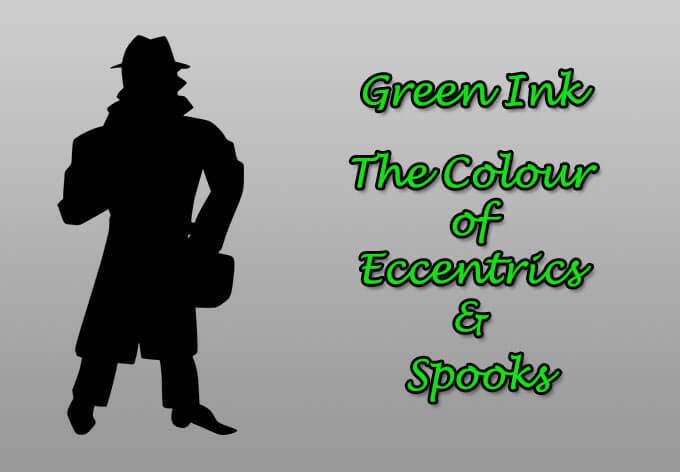 I feel terribly cheated at not knowing this about green ink. If I’d known, I’d have been deliberately using green ink for years. …I do, however, do a large portion of my grading tasks in green ink, so that probably translates to another certain kind of madness. It’s less to avoid the negative stigma and more because I like the color better, but I’m sure that my students find my grammatically relevant puns in the margins to be a bit off. I love using green ink – and I’ve never written a letter of complaint to anyone. I like the implication of slight nuttiness though. I had known about the Head of the Intelligence Service using green ink, but was unaware of any negative (or positive!) association with green inks. Personally I use a fountain pen with a rainbow of coloured inks – several of them green. The worst I have ever heard is that my writing habits are a little excentric – although I think that might be because I write with a fountain pen. Just because some people might think I am a little crazy isn’t going to stop me using greens. Actually, if the Guardian says green ink shouldn’t be used in letters to the editor – that to me seems like a great reason to use green ink. As for teachers using green as it isn’t as harsh as red….well, another to add to the list of reasons why we home school! Thanks for the fab write-up. My cartoon (character) on the home white board has just been given a “lunatic fringe”. Lots of packs of pens in the UK come with 1 blue, 1 black, 1 red and 1 green pen. Most people avoid using the red or green for correspondence, but I expect that those less tied to social convention would be unconcerned by this, and that this would correlate somewhat with mental health problems. I worked in book publication in the 70’s in those days pre computer age. It was known that green ink was used by the printers on manuscripts, galleys and proofs, where as designer and editorial marks were in red. Personally I don’t see any harm in green ink, purple, pink or any other colour! it probably started in India during the Raj occupation by the British. Green is sacred to Hindu’s and particulrlly to Moslems. C.
I finally know what it means to write or have letters written in green. Because before today i had no idea what it meant. Because looking back a while ago i saw a screen printed shirt that said “write it in green” and the font was a green color. and now i understand what that shirt means now. I use green ink with custom-engraved stationery, where the engraving (a picture of our house, surrounded by greenery — that’s why I selected the engraving color) is in green. The ink and the engraving match. I did not intend anything other than matching the color of the trees and hedges. Until the end of the 1980s, account numbers were always checked and initialled in green ink in English banks. I’ll fetch my anorak. I don’t think senior executive can use green ink only. It can be used by anybody who loves green. Green means the symbol of leaves & all kind of greenness. To be boring and prosaic if blue and black are too conventional and red is the hated teacher’s pen then green is the next fairly easily available colour. I’m a teacher and I still use red because it stands out. I don’t like pupils using it because it is difficult to read in large blocks whereas I’m only making comments which is also why I wouldn’t use red or green biro for a letter. Pharmacists probably use green for the similar reasons – it makes it clear which are their notes and which are the doctors’ – and because it is the medical colour. The cross used to indicate a pharmacy is green, likewise first aid boxes. In banks I think red still has a particular meaning! I usually insist on blue or black for exams having spent far too long trying to decipher a paper in pearlescent pastel pink ink and going cross eyed. I’m old fashioned and like writing with a fountain pen and also use lots of different coloured inks when I can get them, often dark purple but greens are in there too. Ask most of my classes and they’ll tell you I’m definitely mad though! E.M. Forster wrote the first drafts of his novel “A Passage to India” in green ink, though I do not know why. One the most sympathetic characters in it, Dr Aziz, is a Moslem. “I do like Islam,” wrote Forster somewhere in his diary account of his time in India. Could that have been a connection? Or was it simply that it was a different colour? accountants – and especially auditors – always use green ink to indicate that they have verified a financial entry. As this activity would seem to be pretty boring, maybe they seek to inject some excitement into their lives by writing ‘odd’ letters to newspapers, and forget to put their green pens down? The activists need to write with invisible ink, too many nuts in the USA also. Must be some profit motive involved. talking would help the learning process without all the shame and finger pointing. I’m a hospital pharmacist and I hate the use of green ink. It smacks too much of the teachers pen or the “pharmacy police” I like being subversive and writing with my black pen! I have insisted on using green ink for the past 15years, initially as I decided one day that it looks better than boring old blue or black. Over time it pleased me that all of my circle associated it with me and I like the idea that I can send cards, notes etc.. and only use icons in green ink and folk would automatically know it is from moi! It bothers me somewhat that it is not so much a fringe thing anymore as using green ink is gaining popularity. In an ideal world I would be a dictator and ban anyone apart from myself using it!! Only kidding! but yes, I am English, am considered eccentric- I know so too. love all things clandestine and am a certified schitzophrenic. Take from this what you will! Weird. I had to look up the meaning of this green ink reference after coming across it in a book. I had never been aware of its association with lunatics. This is most interesting to me, and a bit enlightening, because of my own experience with green ink. Years ago I found a green ink pen and it became my favorite pen for writing in my journal. At some point I lost it and I wanted another. I didn’t want to just buy one though. Finding things has special meaning to me. I randomly decided to put God to the test and prayed that if he exists, provide evidence to me and put another Pilot G2 green pen in my path to find. I had been struggling in my faith and this would be the test. Well, I never did find one, but I did find a store selling them and bought one- reasoning to myself that God doesn’t want me to be passive and wait for him to do things for me but go out and make them happen on my own. A cop out, I know, but there it is. I have that pen still and it is my favorite. Now, years later I come across this reference about green ink and crazies in a book about quantum computing which leads me to this blog which has a picture of my very pen in it! It all makes sense now. I’m a lunatic!